SOUNDING MY BARBARIC GULP! 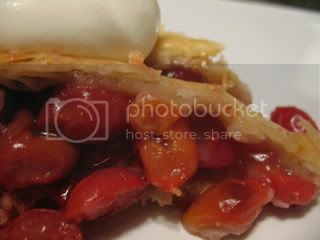 : I made cherry pie! I had another "I made!" moment on Sunday. They occur whenever I make something I thought would be particularly difficult or something that I have finally mastered after a few failures. So far, there have been the I made bread! moment, the I made marshmallows! moment, and the I made ice cream! moment. Yesterday was the I made pie! moment. I've tried to make pie before, with a few mishaps...too goopy filling & store-bought crust, then too crunchy filling with a soggy bottom crust. So, I was both excited and anxious about this week's Tuesdays with Dorie recipe...Double Crusted Blueberry Pie (chosen by Amy of South in Your Mouth). Dorie's crust recipe calls for both butter and shortening (I cut them into the flour by hand this time, instead of using a food processor as Dorie suggests). She then sprinkles breadcrumbs (I used graham cracker crumbs) over the bottom crust to soak up juices and prevent the bottom of the pie from becoming soggy. This was, by far, the best pie I've made! It was very much a Eureka! moment. Not only did the pie look good, it tasted great...the crust was tender and flaky (you can get the crust recipe & blueberry filling recipe on Amy's blog). I filled my crust with sour cherries instead of blueberries, because I had a couple pounds of fresh cherries in my fridge...and because blueberries are so expensive right now! I made the filling a little on the tart side, because I don't like it very sweet. If you want it sweeter, you could add a full cup of sugar. Whisk sugar, cornstarch, and salt together. Sprinkle over cherries & mix together. What a beautiful "I made" moment! Great job! Your pie looks great! I am getting into a dessert mood - don't quite know what I will make, though. Cherry pie! Yum. I congratulate you. 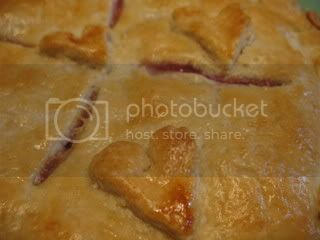 Great pictures of a beautiful pie! Nice job. Congratulations on your "I made" moment! Looks great! Looks like we shared an I made moment this week. 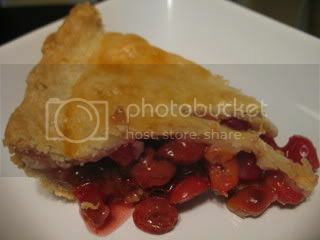 And while my blueberry pie was excellent, I've now got a craving for sour cherries. Yours looks a-MAY-zing. 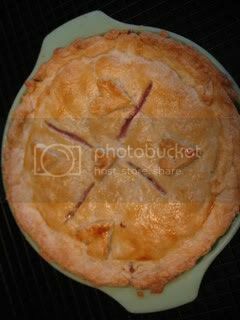 If there is one fruit pie that I probably like more than a blueberry pie, it's a sour cherry pie. And yours looks luscious!